The idea I'll share today is a bit counterintuitive. But it's important to understand. It's what has tripped up many investors after the big rally in stocks lately. Some folks see the move we've had to start the year, and they assume the opportunity today is worse than it was a couple months ago. They assume the market can't be in a better spot after a rally than it was before it began. This thinking may seem to make sense... But it's wrong. It's wrong because the measures of strength I track are actually looking better today than they were at the start of the year. And I'll share one of them with you today. That's the counterintuitive part... that the market can get healthier as it rises. Once you understand this, it becomes clear that we still want to stay long U.S. stocks. I can give you the simple conclusion up front: Stocks are healthier today – after a big rally – than they were at the start of the year. You don't have to take my word for it, though. I've got data to prove it. 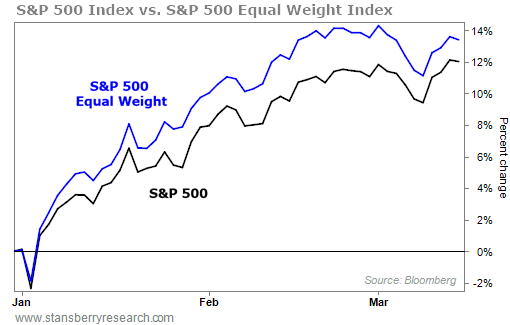 And one of my favorite indicators – the S&P 500 Equal Weight Index – explains what's going on now. The Equal Weight Index gives us a deep understanding of what's really going on in the market. It tells us if a market move is healthy or unsustainable. Microsoft (MSFT) – the largest U.S. stock today – makes up nearly 4% of the index right now. Apple (AAPL) is more than 3%. Amazon (AMZN) and Alphabet (GOOGL) are nearly 3% as well. The problem with this approach is the largest and most powerful companies control the S&P 500. If they're soaring, the index can rise... even if lots of other companies are falling. The Equal Weight Index solves this problem. It weights each holding equally (0.2%), regardless of size. And that means when it's moving higher, we can see that a majority of stocks are surging... not just the largest companies. The good news for our current boom is that lots of companies are participating. The Equal Weight Index broke above its long-term moving average this month. That means the trend is back in our favor. But the full story is even better. It's been a one-way surge higher for the S&P 500 in 2019. We're up 12% in a little more than two months. But the Equal Weight Index has performed even better, rising nearly 14%. That might not seem like a big deal at first. But it tells us that it isn't the big stocks driving the market – it's actually the smaller companies making the biggest difference. And even more important, it shows that lots of companies are rising. That's a sign of a healthy market. Historically, the Equal Weight Index has peaked before the overall market. It tells us ahead of time if a market rally is unsustainable. But that's not happening now. So while most would find it hard to believe, the overall market is actually healthier today than it was in January. The major rally we've seen is happening the right way... with lots of companies moving higher. And that tells me that we want to stay long U.S. stocks. "Your best chance to make major profits is to wait for the uptrend before buying," Brett Eversole says. "You want to take opportunities to 'buy high and sell higher.'" Get the full details on a recent rare move in U.S. stocks – and what you should do now – right here. "Looking at the average lifespan of a stock boom or an economic expansion is not a particularly useful yardstick for how much longer these booms can run," Steve writes. Get his take on where we are in this long bull market right here: The Stock Boom Is Now 10 Years Old... What Next?